The first thing I needed to do was to turn on two-factor authorization. Most people under 50, especially if they’ve produced any kind of online content for work, have had to use this type of security check. The basic concept is to force a second, near-instantaneous verification on a different device (usually a cell phone). It’s mildly annoying, but not onerous. It’s also a good way to weed out people who have stumbled upon a shared computer or who happen to know your password. Unless they also stole your cell phone, two-factor authorization prevents them from accessing your account. Easy enough. Next, I needed to verify my physical address. Unfortunately, this involved sending a snail mail letter that would take up to a week to arrive. Protip: if you’re trying to promote content related to a time-sensitive topic, having to wait a week isn’t ideal. A week is more than enough time for the media to cycle through multiple embarrassing coverage disasters. At this point, I made peace with the fact that my authorization—if it ever happened—would come through too late for me to promote the Covington essay. So be it. I wanted to be ready for the next time. Besides providing proof of a fixed physical address, I also needed to verify my personal identity. To do that, I had to scan both sides of my driver’s license and send those images to Facebook. This is quite odd, as I’ve lived at my current address for more than two years, and I’ve never had an address that wasn’t in Virginia. In other words, I’ve only ever had a Virginia driver’s license, and I’ve been registered there for over two decades. 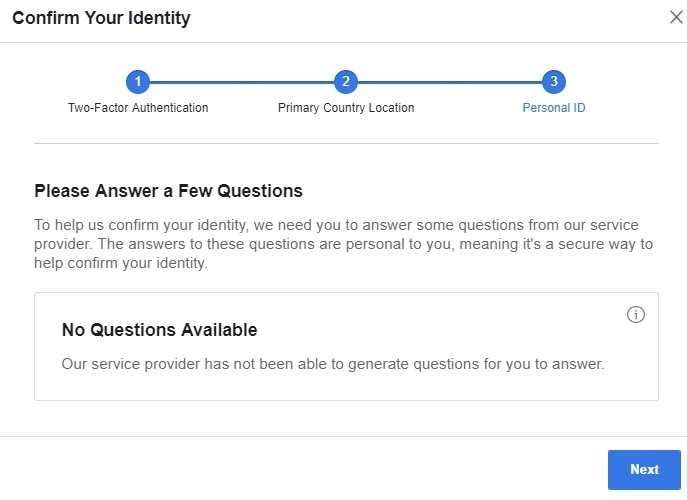 No problem, though: I could apparently just answer a few questions that would allow them to verify my identity. Great. 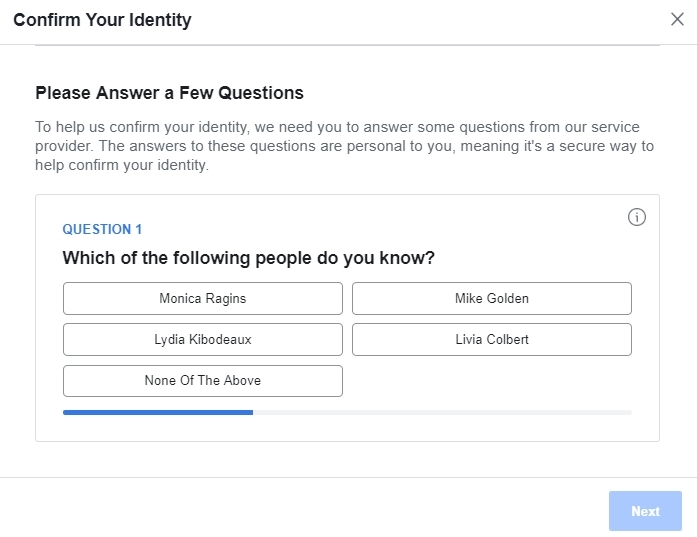 The first question listed several people, and asked which of them were someone I knew. I had never seen any of these names, much less knew the people to whom they were attached, so I said “none.” The next question asked about a series of addresses, and all were similarly unfamiliar. Once I had answered the questions, instead of getting approved, I remained in some kind of review limbo. Ok. Meanwhile, my long-awaited address confirmation letter arrived a few days later. It included a custom code. I entered the code and verified my address. 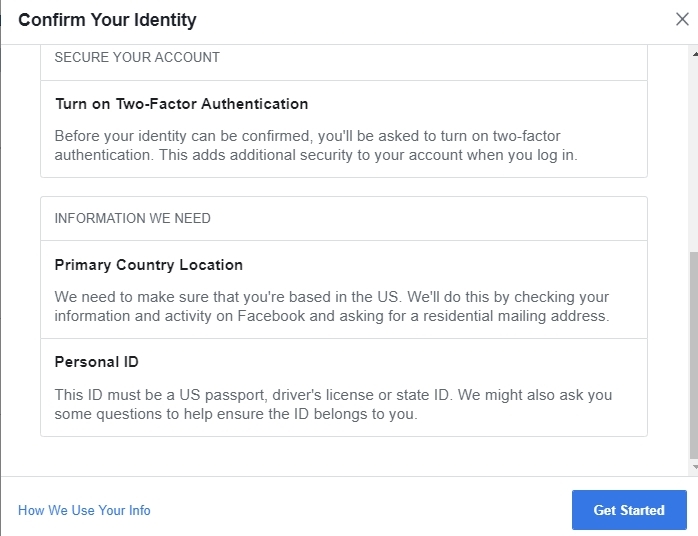 To recap, Facebook now had my credit card on file, a scan of my driver’s license, and confirmation of my physical address (which ain’t in Moscow). And all of that still wasn’t enough. My personal identification still wasn’t consider “verified,” and I couldn’t get any additional questions. Instead, I was told, I would need to get a notarized form attesting to my identity. At this point, I’m a week-and-a-half in. I dutifully went to the Wells Fargo near my office, waited for a bank employee who was also a notary, and filled out the required form and had it notarized. That night, I scanned the form and submitted it, so that Facebook could add it to my now-voluminous file. I then saw that my information had been updated to say that the form was being reviewed. Good news! The bad news? It was being reviewed by the same “third-party service provider” that couldn’t figure out how to corroborate the driver’s license of a lifelong Virginia resident. Finally, three days later, I was “confirmed.” A scant two weeks after originally trying to give Facebook my money to promote my content, I had finally earned the privilege of doing something I had done dozens of times since 2012. There was still another step. “Linking” my ad accounts. This new process involved adding my name to a “disclaimer” that would run with any such ad I promoted. 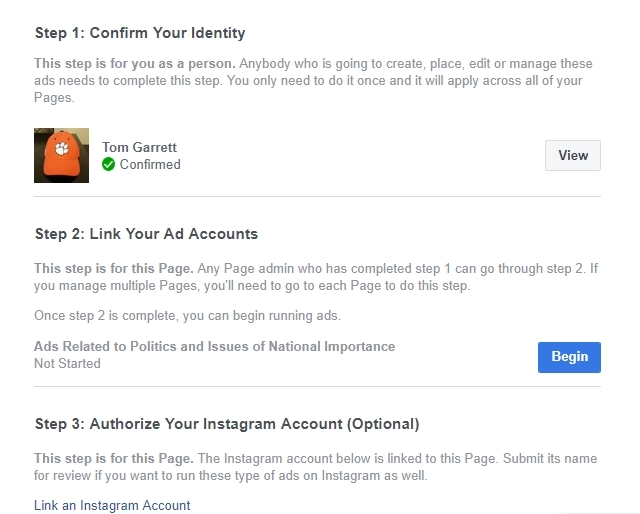 Again, I assume Facebook crafted this layer of protection to prevent deceptive advertising by, say, a conservative group pretending to be crazy lefties. Ok, fine. I tried entering my name (Tom Garrett, which is my real name, in case that needs to be said). 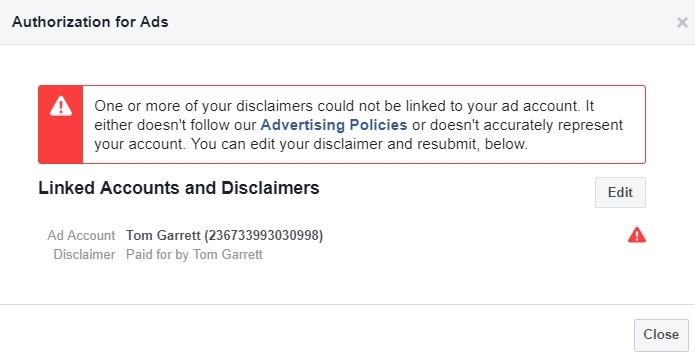 In other words, every promoted ad for a political piece I wrote would have a little notification that said “paid for by Tom Garrett.” Once I submitted my disclaimer, I received a notice saying that Facebook would render a “decision” within 24 hours. One day later, I got a rejection. Somewhat baffled, I tried “Thomas Garrett” next. I figured that the problem might be not using my full, formal name, especially since that’s what appears on my driver’s license, for example. I was completely lost at this point. My address was confirmed, my identity was confirmed, and I was using my real name in these ads. I am the person responsible for these ads! What else did Facebook want? Finally, as a last resort, and without much optimism, I tried simply using the name of my website. At long last, I was approved. The only problem was that it was now February. Still, lesson learned. The diligent gatekeepers at Facebook wanted to make sure that the “wrong” people weren’t presenting criticism of our esteemed media’s ability to cover events fairly and accurately. I’ll be ready the next time. Unless, of course, Facebook throws down a few more hurdles in the name of safety and integrity. This entry was posted in Commentary, General Culture and News and tagged Commentary, Facebook, General Culture and News, Mark Zuckerberg, Security, Social Media. Bookmark the permalink.